RETAIL PRICE = 1269.99/SET. 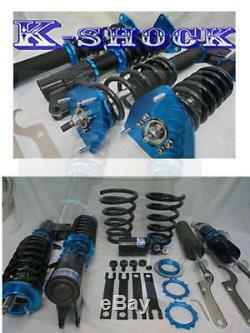 K-Shock Coilover - SUSPENSION BOLT-ON SPORTS Kit. Hot Price with Twin Tube Design. 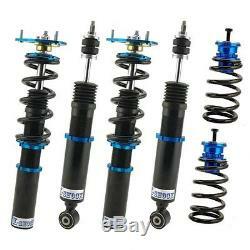 Front and Rear Bolt in Coilover Kits. Another major feature is more durable in the case of damage to the actual damper body. Upper mounts: a camber plate is incorporated into the mount, which gives 0-3 degrees of camber adjustment depending on the application. Damper includes 24 - way damping force adjustment for both front and rear coilovers. Compression and rebound is adjusted simultaneously for ease of adjustment. Vehicle ride height and spring pre-load can be adjusted independently. Ride height is adjustable in two ways: adjustable shock length and adjustable spring seat. Some models do not come with top mounts. LIKE US ON FACEBOOK - "999AUTOMOTIVE". Triple Nine Automotive (999Automotive) was established in 2003 with the goal of providing customers a one stop place for all their vehicle needs. With more than 2000 performance products in our warehouse. We are proud to say that we will be able to cater to your requirements. At the workshop, our mechanics are trained from standard mechanical repairs to performance modifications. Including suspension upgrades and a skilled in-house fabricator for your custom requirements. Equipped with a 4WD dynamometer from Dyno Dynamics. 999 Automotive provides aftermarket ECU tuning along with our customers being able to find out how much power their car produces in ShootOut mode. Our aim is to make our customers' cars reliable, we want our customers to enjoy the fun of the modifications we perform to their cars. Therefore, the power figure is not the only thing we are concern about. We care for all the modifications that make your car run smooth. In addition, we offer car enthusiasts our technical experience and expertise as well as the ability to diagnose and rectify any mechanical problems of your car to perform better or run more cost efficient. Our showroom displays a wide range of products for both interior and exterior upgrades from appearance to performance. Over the years, 999 Automotive has attained sole distributorships in Australia for K. Power Spirit, ZERO-1000, CUSCO, SKUNK2, SPRINT BOOSTER and IMPUL. (QLD Dealer: Buddy club, TEIN, 5-Zigen, K-Sport, Project Mu, Nismo, Haltech). On top of that, we also carry other brands such as Tomei, Defi, Hondata, Whiteline and many other brands. Sydney - Yagoona Store Sydney - Regents Park Workshop Brisbane showroom / workshop (4WD DYNO). SYDNEY: 32 Carlingford street Regents Park NSW 2143. BRISBANE: 3/806 Beaudesert Rd Coopers Plains QLD 4109. This can be paid in Australia Dollar. We will arrange the product for you and inform you when they are ready. We are more than happy to assist you. Please ensure that you read and acknowledge the following terms and conditions prior to placing your order with TRIPLE NINE AUTOMOTIVE. All prices and descriptions are subject to change without notice. TRIPLE NINE AUTOMOTIVE shall have the right to refuse or cancel any order placed for product listed at the incorrect price. All products on this website are intended for race or off-road use only. It is the owner's responsibility to be aware of the legalities of fitting these products in his or her state/territory regarding noise. TRIPLE NINE AUTOMOTIVE will not be liable for any special, direct, indirect, incidental or consequential damages that might be claimed as a result of the failure of any part, including claims for delay, loss of profits, or labour. TRIPLE NINE AUTOMOTIVE will not be liable for any damage or injury to persons or property resulting from improper installation or misuse of any part. TRIPLE NINE AUTOMOTIVE shall not be held accountable for any misconception or disappointment associated with any product. All goods remain the property of TRIPLE NINE AUTOMOTIVE until paid in full. It is the customer responsibility to contact TRIPLE NINE AUTOMOTIVE within this time period to be eligible for a return. It is the responsibility of the customer to verify the correct part before ordering and installing a particular part. All foreign orders are final. The item "K-SHOCK coilover kit fully adjustable SUSPENSION KIT SUIT Ford Falcon BA-BF" is in sale since Tuesday, June 14, 2016. 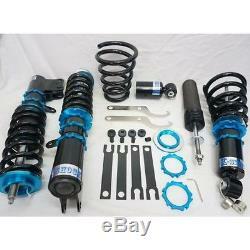 This item is in the category "Vehicle Parts & Accessories\Car & Truck Parts\Other". The seller is "999racing" and is located in 2143. This item can be shipped worldwide.